If your property does not have a water meter, you’ll be charged based on your property’s rateable value (RV). You may receive multiple invoices for your water due to amendments made to your bill. We are legally obliged to send every invoice for your records; however you only need to pay the last one. They should all arrive at the same time so you can identify the one to pay. You will have one or two supply point ID (SPID) numbers. One is for your water connection and/or one is for your waste water connection. This lets us know where your access to water is. This covers the provision of a clean, fresh water supply. As you do not have a water meter, this charge will be based on the rateable value (RV) of your property. It’s possible you could make a saving by having a water meter installed. You can find out more about reassessment and having a meter installed here. If you’re entitled to any discount, this is where it will appear on your bill. Fixed charges are applied to all properties for the upkeep of external pipes and pumps that supply water to your property and remove waste water from your property. The Rateable Value (RV) is an assessment of the value of a property made by the Scottish Assessors Association. We are required to use RV to calculate water charges for all properties that do not have a water meter fitted. It’s possible you could make a saving by having a water meter installed. You can find out more about reassessment and having a meter installed here. All water needs to be collected and treated before it can be used. If your business is in a shared property, these are shared amongst all properties. Got a question about Unmetered Bills in Scotland? We’ve included our most asked questions below. 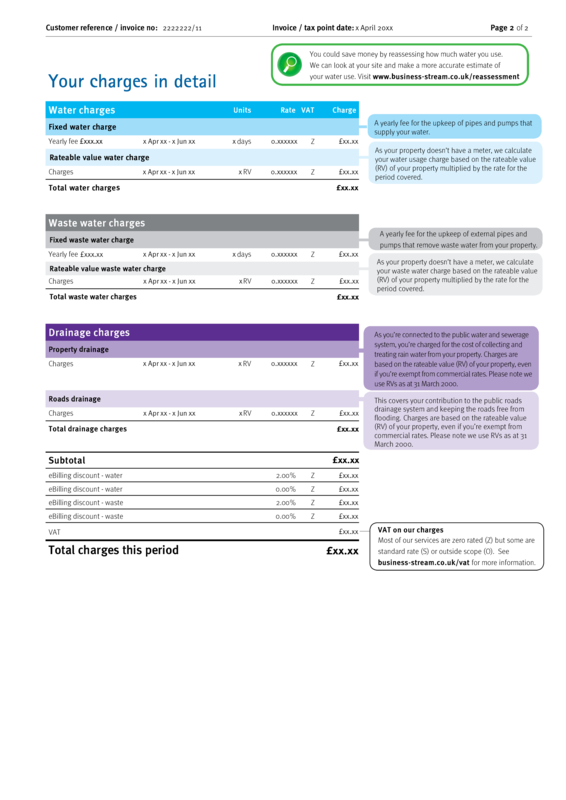 What period of time do the charges on my bill cover? The period of time that your charges cover is displayed on the first page of your bill, above the account summary section. 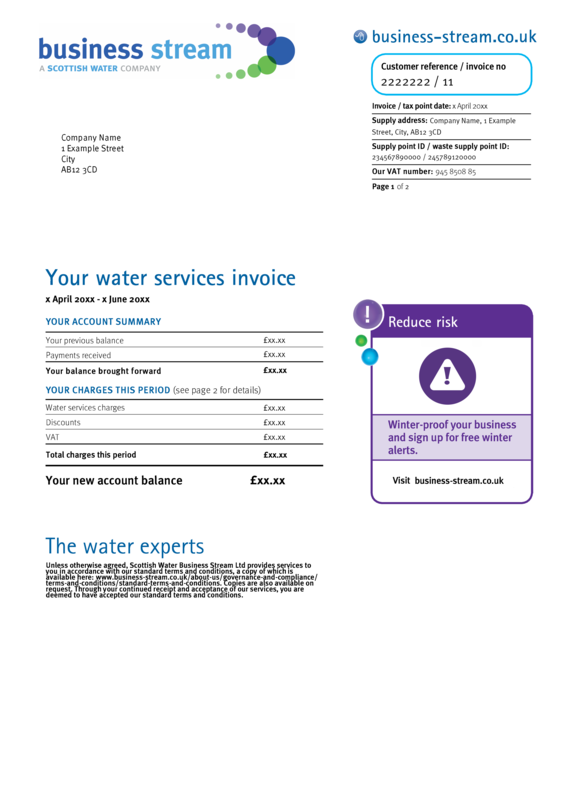 For customers who do not have a water meter, your bill will usually be issued to cover your charges for the next year. This bill will be issued in the first quarter of the year and can be paid in monthly instalments. How do you calculate my charges if I don’t have a meter installed? The method for charging business properties in Scotland that do not have a water meter is laid out by regulators in the water industries market code. All business water retailers, like ourselves, are required to calculate these charges using the Live Rateable Value figure as given by the Scottish Assessors Association which was updated in April 2018. You can find out more about this here. Can I have a water meter fitted? We recommend using our reassessment calculator to help give an indication of whether you might be better off having a water meter installed. Installing a meter means that instead of being charged based on your Rateable Value, we’ll read your water meter regularly and calculate your charges based on the amount of water that you consume. If the reassessment calculator indicates that having a meter fitted may be a good option for you, you may want to consider applying formally for reassessment. During this process, we’ll liaise for you with Scottish Water as they review your circumstances and see if a meter can be fitted. Why have I received multiple bills? Usually, you’ll only ever receive one bill from us. However, if we need to make an amendment on your account, this can result in receiving multiple bills or invoices through the post from us. We’ll always endeavour to let you know if this might happen by contacting you over phone or email. When an amendment is made, we’re required to ensure that a full record of this change is provided to you. Sometimes it’s not possible to show an amendment on a single bill, so more than one may be generated in order to accurately display the steps that have been taken. Our bills produced in numbered order, so even if you receive more than one on the same day, simply look for the invoice number at the top of the page. This can be found after the forward slash next to your customer reference number. How can I get a discount on my bill? We have a number of ways in which customers can save money on their bills. This could be by signing up for direct debit, eBilling or by signing up to a one, two or three year contract. Find out how much you could save with an instant quote here, or get in touch with one of our water experts to discuss the options available.